In the United States, there are between 45 million and 46 million turkeys killed each year by profit-seeking farmers for consumption at Thanksgiving dinners around the country. In total, about 245 million turkeys are raised on American farms every year, with pretty much all of them headed for an afterlife of human consumption. Yet, it is never even suggested that because of these mass killings, we are running out of turkeys or that turkeys are headed for extinction. On the other hand, we can compare this to some popular species of fish, such as cod or tuna. Many millions of pounds of these fish are harvested each year from the oceans by profit-seeking fishermen. These fish are also destined for an afterlife similar to those of the turkey. And yet, unlike the turkey, we are told the populations of these and other fish are dwindling dramatically. According to the International Commission for the Conservation of Atlantic Tuna, over the past 40 years populations of the Atlantic bluefin tuna have fallen by 72 percent in the eastern Atlantic and 82 percent in the western Atlantic. Governments have put in place aggressive recovery plans meant to stem this tide and hopefully reverse this trend. To answer that the problem is “overfishing” due to excessive demand, as is often done, is to beg the question. If oceans are being overfished, i.e., fished at a rate where the populations of the relevant fish cannot be sustained, why is this not the case for turkeys? 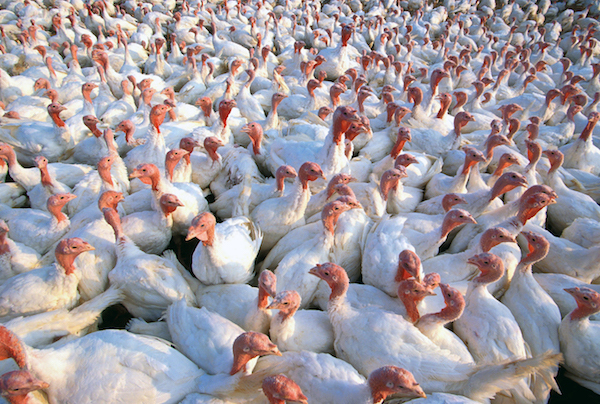 Why aren’t turkeys being killed at a rate that cannot sustain the population of turkeys for future consumption? The answer to these questions has everything to do with the alternative institutional and legal settings in which fish and turkeys are harvested for sale and consumption. Tuna are gathered and killed for market in a setting that gives rise to something called the “tragedy of the commons.” Fish in the ocean do not become the private property of the fishermen until they are removed from the ocean. Fish in the ocean are unowned. They are what is referred to as a “common pool resource.” This creates perverse incentives for fishermen. The unspoken mantra becomes “leave no fish behind.” If you want those valuable tuna swimming under the sea to become your tuna available for sale, your incentive (in the absence of some kind of punitive regulation) is to catch as many as you can as quickly as you can. The reason for this is that, with the ocean being a “commons,” if you don’t get the fish some other fishermen will. This is why large fishing trawlers have become commonplace in the fishing industry, and their use has been restricted. This is the tragedy of the commons. There is no incentive to take care of, or husband, the resource. There is no incentive to make sure that the habitat is, with respect to the fisheries, growth-enhancing or to leave any fish that has any market value behind, even if that fish might be more valuable at a later date. The good news is that the advantages of private property and the disadvantages of common pool resources are beginning to be understood by those who are trying to make a sustainable living in the fishing industry. Open ocean fish farms are beginning to spring up in an attempt to overcome some problems related to defining property rights to sections of the ocean. There are also attempts to mimic a market setting through what are called tradeable fishing quotas, which are being implemented for different fisheries. Of course, freshwater fish like catfish and tilapia have been raised and harvested on private fish farms, not all that different from private turkey farms, for many decades without any concern for over-harvesting or fish depletion. Dr. Roy Cordato is senior economist and resident scholar for the John Locke Foundation.